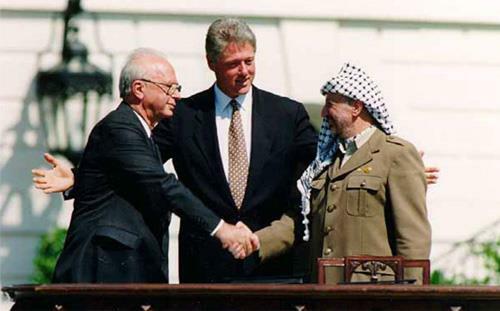 A quarter-century after they nearly happened, the Oslo Accords have largely become another footnote in the frustrating quest for Arab-Israeli peace in the Middle East. The Oslo Diaries, a documentary that airs at 8 p.m. ET Thursday on HBO, argues that despite their ultimate failure, they kindled a spark of cooperation that one day just might still light the path to better lives for everyone on both sides. The Oslo Accords were hammered out over several years by representatives of Israeli and Palestinians, through a process that began as a series of secret, extra-legal meetings and eventually involved public representatives from both sides. The final version of the Accords was built on compromise, including the withdrawal of Israel from some territories. Depending on your political stance, they were either a tragically naïve and misguided attempt at mutual appeasement, or a long-overdue acknowledgment that both sides deserved certain rights, freedoms, and security. The debate became moot on May 5, 1996, when Benjamin Netanyahu was narrowly elected president of Israel. Unlike his predecessor Yitzhak Rabin, who supported the Accords, Netanyahu opposed them. The Accords were to be made permanent in 1999. The Palestinians signed off. Netanyahu declined, relegating them to history. Whether that decision reinforced the security of Israel or doomed the region to perpetual conflict remains a matter of daily debate. Those not debating include Mor Loushy and Daniel Sivan, directors of The Oslo Diaries. They mourn the failure of the Israelis to embrace the Accords, underscoring their argument by noting that since 1996 more than 16,000 people, from both sides, have been killed. Shimon Peres, who was foreign minister in the early 1990s and died in 2014, tells the filmmakers in his last recorded interview that he still feels the Accords would have been an historic step toward peace, which must be everyone’s goal. While The Oslo Diaries includes some of this retrospective analysis, it primarily draws on contemporary diaries and home movies from the participants on both sides. The initial meeting involved five people, Israeli academics Yair Hirschfeld and Ron Pundak, and three PLO officials, Abu Alaa, Maher El-Kurd and Hassan Asfour. To even get there, the Israelis had to lie to their superiors, saying they were going to Oslo to attend an academic conference. It violated Israeli law to talk to Palestinians like this. Over several years and hundreds of meetings, proposals were hammered out. These, too, had to remain secret, since it would have been political suicide for the Rabin government to acknowledge it had been talking in secret to the PLO, which was widely viewed in Israel as little more than a gang of terrorists. Conversely, the PLO said its constituency was beyond frustrated – that for more than 40 years they had lived under the thumb of Israel. Basic justice, said the PLO, dictated there should be a Palestinian state. Somewhere between these two perceptions, The Oslo Diaries says, the two sides found common ground that could have pointed toward a better life for both sides and an end to decades of violence. Toward the end of The Oslo Diaries, when it has become clear the new Israeli government will never sign the Accords, one negotiator says that missing this opportunity means another window won’t come along even in time for his children. Maybe his grandchildren. The filmmakers share his despair. Just by making The Oslo Diaries, however, they suggest it is not impossible for adversaries to come together. If it happened once, it could happen again. It just requires people who believe and trust.